With temps ranging from the negatives to all the way up to the high teens, Indianapolis hasn’t been much fun for any runners, I’d imagine – particularly in the morning. Nonetheless, I still see some brave souls out there in the afternoon pushing through the elements. Ice and wind are the biggest obstacles. RunnerRich had none of that. After cherry-picking research that supported a speed and power based plan, I began in late January. The basic pattern alternates between weight lifting and interval workout days with a rest day on Sunday. Where? An indoor track near my job. The results so far? 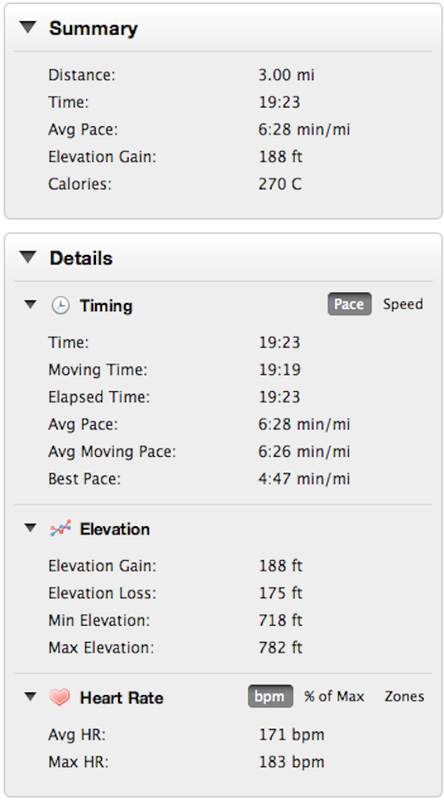 In the same condition was I in last August (sub-19:00-ish) with a similar resting morning heart rate (sub-50 bpm). The real key pushing forward will be continuing to improve size-to-strength ratio. That is, controlling my diet to stay smaller (no 50-mile weeks to help out anymore) and improving overall strength and stability in the gym. Did I mention I started the latest plan in late January? What was happening before then? A pile of F.A.I.L. Began in November with a plan that put me on the road about 10-12 hours a week – trying to build an aerobic base and give myself a great excuse to eat whatever I wanted. It took about two weeks before pain in the right knee and right foot derailed the high mileage train. Lingering pain in both knees in fact, kept me on the sidelines sporadically up until late January. Likely lost about 2-3 weeks in that span altogether. In all honesty though, if the knee pain didn’t stop the outdoors running, the cold would have – or at least I would have let the cold break it up. Probably not a smart plan on my part. Since then, weights have helped me to build strength in my legs gradually, and I’m having fewer problems with pain. I don’t have a running workout that I don’t enjoy right now (i.e. running has been great). Mondays are fast: 8x200m indoors. Wednesdays and Fridays are not as fast: 8x400m and 8x800m. My initial concern was that speed would burn me out quickly, but I’m finding that by not running at all on consecutive days, I can recover pretty well. One of the greatest feelings last month was completing an 8x200m workout on consecutive weeks while moving from 4 minutes to 2 minutes rest. Long story short, the fast stuff is making the longer stuff feel easy. Looking forward to continuing the pattern in March, though I’m anticipating some schedule breaks due to travel. *Note I have some pace times in mind, but generally, I like to surprise myself out there these days. Go by feel and stay consistent. Workout: 3 miles @ 6:10 pace; core work. Weather: 66 degrees, cloudy, wet. Recap: Can’t believe that heart rate. Doesn’t make any sense at this point. Happy with it, but a little suspicious of the monitor and watch. Struggled early in the week. I will say that I have focused more on breathing in the last two days. I think somehow I’ve been holding my breath a little early in the runs, thinking that I was conserving energy and holding form. Not the smartest thing. Opened up this run taking deep breaths in an out. Never really got too difficult. One thing I will say about faster paces is that I have to keep my concentration. Putting it on auto-pilot almost always leads to a reduction in speed. Battled through the core work afterwards. Still haven’t gotten around to making a new meal plan. Just throwing down random carbs. Hopefully, I’ll get to it today. Have a great day and thanks for reading! Workout: 3 miles @ 6:30 pace; core work. Weather: 55 degrees, rain. Recap: Motivation. Wet and miserable outside. Ruining everyone’s Memorial Day plans. I thought about taking it to the treadmill, but went outside because I didn’t want to miss an entry on the Garmin website. Yep…losing it. It was still so much fun to be out there though. The rain just helped to focus on getting back inside. Loving the increase in intensity. Last two days have been great. Ready for more. Have a great day and thanks for reading! Workout: 2 miles @ 6:50 pace; core work. Weather: 61 degrees, cloudy. Recap: Week 4. A down week. Down to 2 mile runs all this week at the same pace. Looking to recover a little bit. Even taking some reps off the core work (V-situps, supermans, hip thrusters, crunches and side crunches). No speedwork in my plan this time around. The gamble that I’m making here is that I have enough natural speed to meet most of my goals. For instance, by training at 6:50 pace this month, I will be able to run a 5k at 6:17 pace because I’ve already got the speed. What I lack, is endurance and stamina, that is, 6:50 needs to begin to feel really easy. So easy I could run it for 5-6 miles. 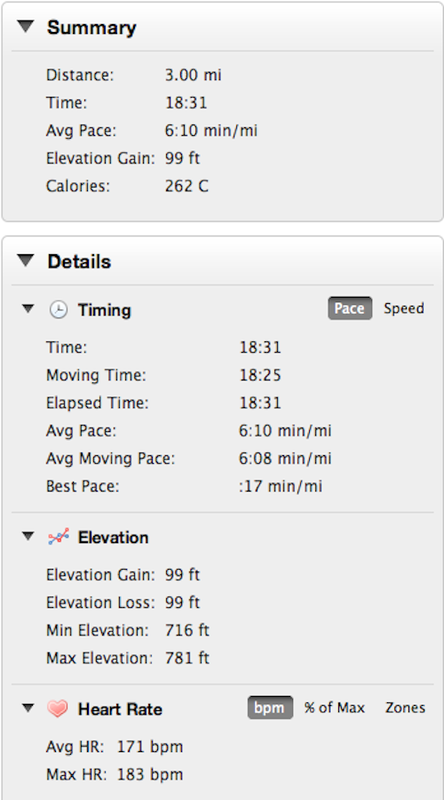 By the end of the August, it needs to be easy to run 6:50 for 9-15 miles. But rather than go up in distance, I’ve chosen to get faster. 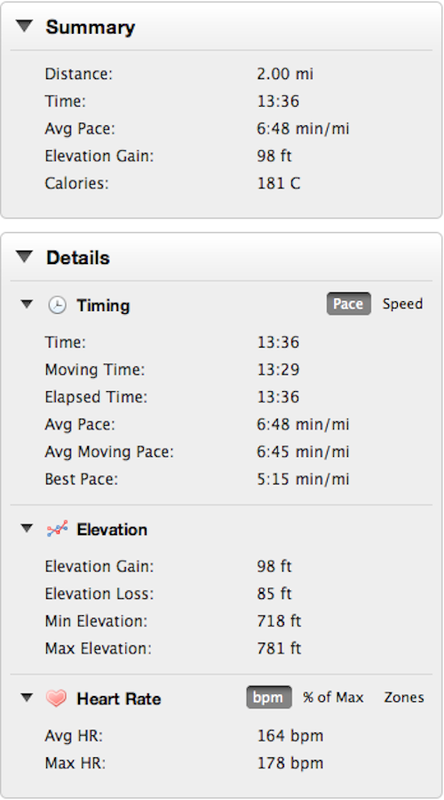 If I can run 3 miles in 6:15 consistently in August, then it should follow that I can run 6:50 for 9-15 miles as well. In short, get faster, make slower distances feel easy.